These amazing Himalaya Water Towers are designed to stem the impact of global warming by collecting and storing water, helping to regulate the use of our planet’s most precious natural resource. The towers are set up on spiraling tendrils that ensure they are able to meet the water needs of nearby villages as well as distant locales as the world’s needs evolve. 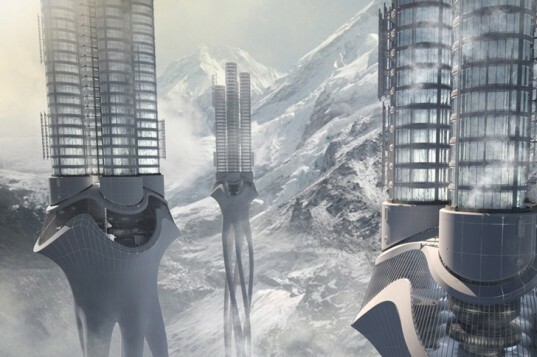 Conceived by Zhi Zheng, Hongchuan Zhao, and Dongbai Song, this cluster of futuristic towers tucked high and away in the massive Asian mountain range recently took top prize in the eVolo Skyscraper Competition. The Himalaya Water Tower is not unlike a giant plant. Its massive stem consists of six twisting legs covered in cells that collect and transport rainwater. The tower’s core consists of four wide cylinders that support the upper partition while hosting systems that purify and freeze the collected water. The upper-most section of the tower, visible amongst the snowy mountaintops, is a glowing storage system that keeps all the collected water safe above ground. The tower also contains channels of tubes similar to a plant’s roots that flow down to the ground level, transporting water to nearby towns and villages. The channels are also designed to include a railway that can carry people and goods throughout the treacherous mountains. It’s no wonder this design won first prize with its innovative approach towards what a skyscraper can do for the environment. These amazing Himalaya Water Towers are designed to stem the impact of global warming by collecting and storing water, helping to regulate the use of our planet's most precious natural resource. The towers are set up on spiraling tendrils that ensure they are able to meet the water needs of nearby villages as well as distant locales as the world's needs evolve. 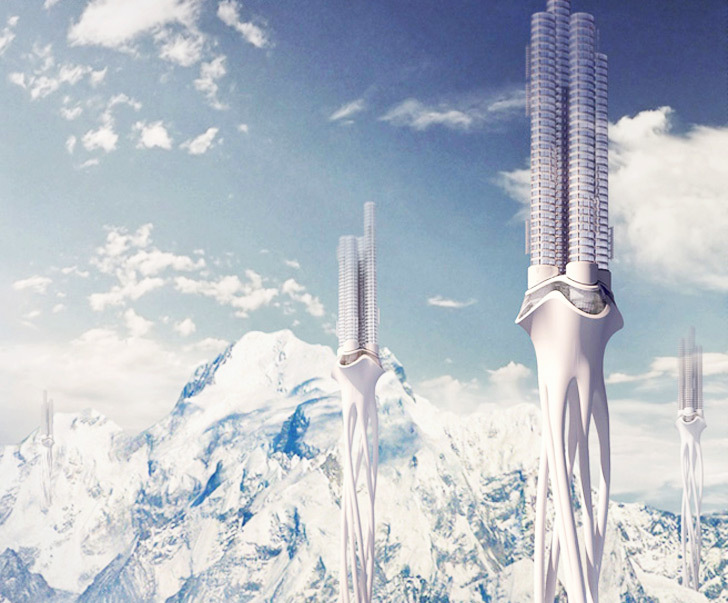 Conceived by Zhi Zheng, Hongchuan Zhao, and Dongbai Song, this cluster of futuristic towers tucked high and away in the massive Asian mountain range recently took top prize in the eVolo Skyscraper Competition.